This is apparently virtual idol Hatsune Miku. Other than the pony tails and blue eyes, the drawing looks nothing like Hatsune Miku. It does look like Louis Vuitton's 2013 spring collection, though. At least they got that right! Hatsune Miku originally debuted as a character for Vocaloid software, but has since gone on to become Japan's biggest virtual idol, holding live concerts and appearing in her own video games. Marc Jacobs, the creative director for Louis Vuitton, did this Miku design as part of a collaboration for an upcoming opera titled The End. Debuting this December in Yamaguchi, Japan, the opera will feature Vocaloid singing software and virtual talents like Miku instead of real performers and a live orchestra. 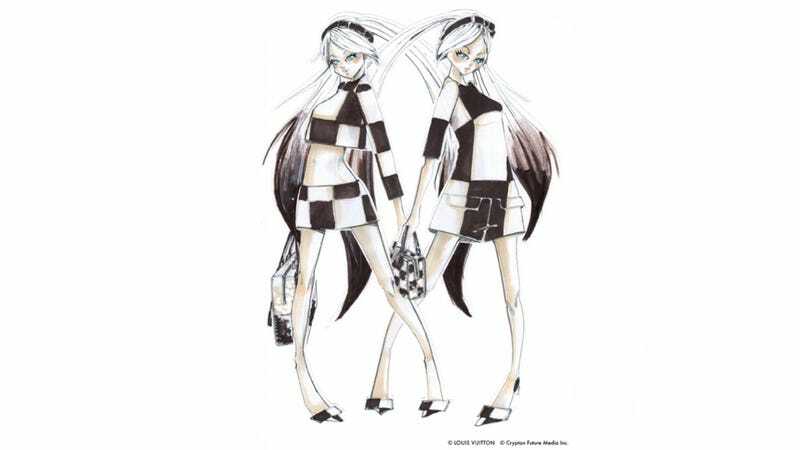 Miku will be wearing LV and carrying a Vuitton "Speedy" bag. Online in Japan, the reaction to the Jacobs design has not been kind, with people pointing out that this design not only doesn't look like Miku, it just doesn't look very cool.